Caption slip reads: "Daily. Photographer: Richardson. Date: 1952-09-22. Reporter: Swaim. Assignment: Murder widow. 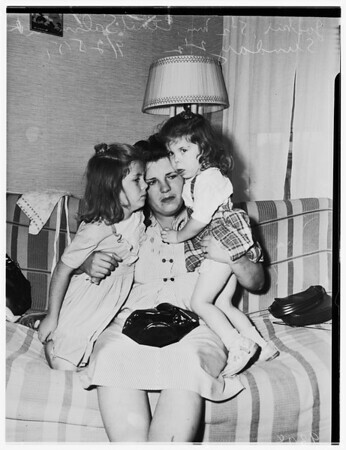 K1, 2, 11, 12: Mrs. Ethel Salmons, 24, with her orphaned children (daughters) Jackie, 5 1/2, (left) and Sunday, 2 1/2. They are left completely destitute by murder of Mrs. Salmons' husband, Harry Salmons, Monday. Note: in one shot, a grab, youngest girl, Sunday, may be on left".